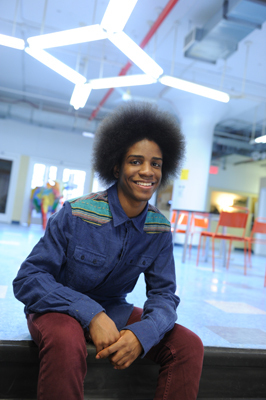 Vaughn joined The Door when he was 14, one of the first members of the Summer Dance Intensive. Led by Performing Arts Coordinator Anthony Rodriguez, the Intensive is a six-week “boot camp” where young people learn a huge range of techniques, as well as tips for building a dance resume, preparing a successful audition, and maintaining good nutrition while training. Vaughn remembers being very nervous at first, but he knew he needed a well-rounded training in dance in order to turn his passion for performing into a career. Now 20, Vaughn has participated in the Intensive every summer, growing and blossoming along with it. He credits Anthony with much of his growth – “he is the dance parent I always wanted!” With Anthony’s support, Vaughn mastered numerous styles and secured a full-ride to the University for the Arts in Philadelphia. Recently his mother suffered a stroke and Anthony was there again, helping Vaughn navigate the transfer process so that he can be closer to home, while continuing to pursue his passion. Fortunately the nerves from that first day at The Door are gone – “The Door helped me to not be afraid. Now I know I can do anything,” he says. Studies have shown that arts education leads to improved GPAs, test scores, decision-making, and more, yet public funding for arts in NYC schools has steadily decreased in recent years. In 2014, The Door significantly increased its arts offerings, including nearly tripling the number of youth participating in Summer Intensives.